When DSI announced the Pro 2, many considered it to be the long–anticipated successor to the esteemed Sequential Circuits (SCI) Pro One from the early 1980s. Of course, it’s not; its architecture and the breadth of its capabilities make it at best a very distant descendent. Nevertheless, the name is well chosen because it suggests that this is going to be a cut above any previous DSI monosynth. Unfortunately, some people aren’t going to give it a chance to prove this; I’ve already read comments (many written, I fear, by people who have never played one) that dismiss it because of its hybrid analogue/digital architecture. So let’s be clear: the filters, the audio amplifier and the final output stage are analogue. The oscillators and Character effects are digital, as are the LFOs, the contour generators, the modulation matrix and the delay lines. If this bothers you, feel free to read no further. But it would be a shame if you went for a bevvy now, because there’s lots of exciting stuff to be discovered here. Given its appearance, it’s inevitable that people are also going to view the Pro 2 as a monophonic version of the Prophet 12. In fairness, there are many points of similarity, but there are as many significant differences between the two. For example, whereas the 48 primary oscillators in the polysynth offer 12 Special Waves and three colours of noise, in addition to the four standard analogue waveforms, the Pro 2’s four primary oscillators also offer 13 additional Superwaves. These comprise multiple instances of the sawtooth and each of the special waves, and you can detune these to create chorusing. Because you can modulate the amount of detune (and do so using numerous different modulation sources acting upon a different Superwave in each of the four oscillator slots) you can generate all manner of sounds ranging from the delightfully subtle to extravagant layers of wibbly mayhem. Add oscillator sync, FM and AM of each oscillator into the equation, and a vast range of chorused, sync’ed and modulated (and simultaneously chorused, sync’ed and modulated) sounds are possible. Now add Osc1’s sine wave sub–oscillator, noise modulation, and multiple types of portamento that you can apply to each oscillator individually, and it’s clear that the Pro 2 is far more than a modern hybrid pretending to be a traditional analogue monosynth. 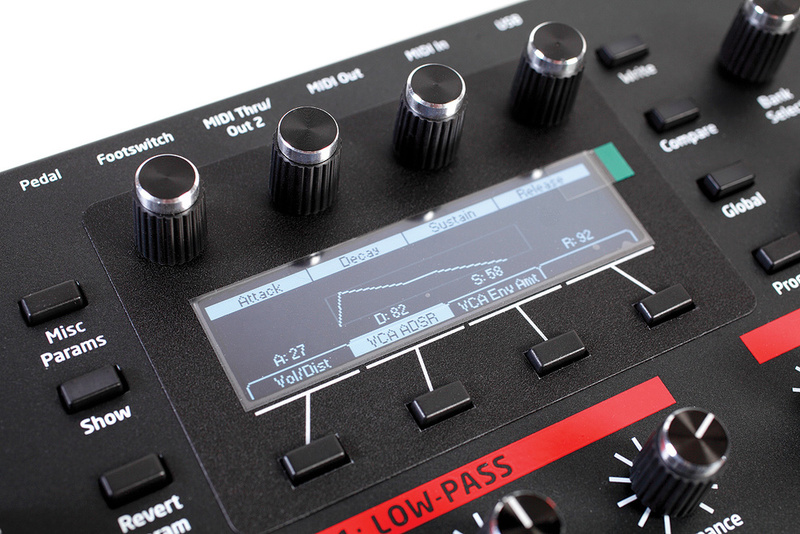 The Pro 2’s front panel measures 74.2 x 32.5 cm.Lying between the oscillator mixer and the filters, there are five waveshaping effects derived from the Prophet 12. Girth and Air accentuate the low and high frequencies (respectively) of the sounds, while Hack and Decimation reduce their word length and sample rate before conversion to the analogue signals that will be fed to the filters. The fifth effect is Drive, which allows you to create anything ranging from a gentle overdrive to (with appropriate Hacking and Decimation) the sounds of alien hordes invading. Next, the Prophet 12’s powerful filter section has been replaced by an even more powerful architecture that consists of a self–oscillating 24dB/oct low–pass filter and a 12dB/oct, resonant but not self–oscillating, state–variable (LP/BR/HP/BP) filter that can be patched in series or in parallel. Actually, that’s not quite right. At the two extremes of the routing parameter you’ll find pure ‘in series’ and pure ‘in parallel’, but you can dial in any value you fancy between these, blending the signal filtered by both devices in series with the signals processed by Filter 1 alone and by Filter 2 alone. In addition, you can direct just oscillators 1 & 2 to Filter 1, and just oscillators 3 & 4 to Filter 2. These are not trivial tricks. Each filter has a dedicated contour generator to control its cutoff frequency. From the control panel, you can treat each as a bipolar ADSR, but the menus provide access to a delay before the onset of the Attack (making each contour a five–stage HADSR), plus velocity sensitivity for the contour amount. Naturally, the contour rates can be modulated, and there’s also a Repeat mode that loops the HAD stages. In short, there’s a huge amount of flexibility here. Turning to the filters themselves, you could describe these with no little accuracy as ‘Prophet–y’ (Filter 1) and ‘Oberheim–y’ (Filter 2) and, if you send a simple signal through one or the other in isolation, that gives you a reasonable idea of what to expect. However, the real flexibility lies in the simultaneous use of both. Imagine passing one waveform through Filter 1 with one combination of cutoff frequency, resonance, key–tracking, contour and modulation parameters, and passing a second through Filter 2 with a different profile and a different set of parameters; you can obtain two very different sounds, and the possibilities for layering and otherwise combining them are huge. You can even create D50–style ‘SAS’ patches with one timbre for the attack phase and a different one for the body of the sound. The only obvious limitation is that you can’t push Filter 2 into self–oscillation. That’s a shame, but not a problem. The next stage in the signal path is an output boost that can drive, overdrive, or even distort the filtered signal before it’s passed to the audio amplifier. This also has a dedicated contour generator that, at first, appears to echo that of the Prophet 12. But, while the velocity–sensitive, looped HADSR structure is retained, there’s a huge difference: where the polysynth has a Pan parameter that allows you to spread its 12 voices across the stereo soundstage, the monosynth has another distortion circuit that can add yet another level of overdrive to your sound. Interestingly, the tunable feedback loop following the amplifier — which takes the analogue signal, converts it to digital, and then injects it back into the Character effects section — is also different from before. When ringing, it will track the keyboard for another octave, and it has a cleaner and more defined sound. But if you add drive, drive and yet more drive... well, if you like to listen to synths scream, this is one way to make them do it. You can now pass the analogue signal unmolested to the final output, which comprises a fourth overdrive and a master volume control. Happily, even at maximum distortion and level, the Pro 2 doesn’t suffer from the oscillator leakage that made its way to the outputs of the Prophet 12, and the signal/noise ratio is remarkable given the number of gain/overdrive stages available. But if you’re willing to allow the digital side of the Pro 2 to do its thing, the Delay section — which sits between the amplifier and the output section — offers four, sync’able delay lines. The legends on the control panel imply that three of these are digital, whereas the fourth (by use of the name BBD) is analogue. In fact, all are digital, although DSI claims that the fourth has been programmed to emulate an analogue delay. The manual states that the maximum delay time is 1s, but that’s wrong; the maximum for the BBD effect is 1.5s, and there’s an additional Long/Short parameter in this to help you to create modulation effects such as chorusing and flanging. Inevitably, the results lack the deep whoosh of an analogue stompbox so, if you want the sound of the Pro 2 going through an Electric Mistress, you’ll just have to plug it into one. But imagine what you can do with four delay lines that allow you to modulate all of their delay times, feedback amounts, levels and pans independently, and which also offer independent LP/HP filtering for each! The potential for spatial effects is mind–boggling. Nonetheless, if for some reason you have access to only a single quarter–inch cable, an unusual but very welcome mono mode defeats the pan and stereo modulation settings so that a sensible monophonic signal emerges from a single output. In addition to those already mentioned, there are two further contour generators that you can assign to the full set of the Pro 2’s modulation destinations within their own programming pages. (Of course, all five contours are also freely assignable within the modulation matrix, and we’ll get to that in a moment.) There are also four LFOs, each offering control over rate, amount and waveshape and, in addition to being available as sources within the modulation matrix, each can be directed to the complete list of destinations from within their own pages. Each LFO is individually sync’able to the internal clock or MIDI, and you have control over slew rate, wave reset at the start of each note, and the phase of the waveform when reset. This then brings us to the modulation matrix itself, which offers 16 freely programmable slots (source, amount and destination) plus 25 described as ‘fixed’, although many of these still allow you to determine the destination and/or modulation amount as you choose. So, that’s 41 slots offering a total of 51 sources (many of which can run at audio rates) and 142 destinations, which is considerably more than the Prophet 12. When you add the destinations accessible directly from the auxiliary contour generators and the LFOs, the power of the Pro 2’s modulation architecture becomes readily apparent. The four CV outputs on the rear panel of the synth are four of the destinations in the modulation matrix, and these suggest all manner of exciting possibilities. But while I’ve read eulogies elsewhere regarding the analogue I/O, I have to wonder if the writers ever tried using it, because this was the one area in which the Pro 2 presented some unexpected difficulties. I took my Roland SH101 and patched the Pro 2’s CV Out1 and Gate Out to the SH101’s CV In and Gate In, then directed the Note Number to CV1 Out in the modulation matrix and played... and the notes I obtained from the SH101 were three octaves higher than I expected. I measured the voltage produced by the CV output and, sure enough, it was 3V higher than I had expected. What was going on? I found the answer in a DSI Technical Support document that explained that this wasn’t an error; the company had taken the decision to make middle ‘C’ generate a pitch CV of 5V. So I used the modulation matrix to direct a large, negative DC offset to the CV output driving the SH101. Actually, I needed to use two slots to bring the Roland down to its usual pitch, but then all was fine. Similarly, when I patched the CV and Gate outputs from the SH101 to the CV In1 and CV In4 on the Pro 2, setting the latter to be its Gate source, I obtained a pitch from the Pro 2 that was approximately 14 semitones above what I expected. Again, a suitable DC offset sorted everything out in a few moments, but I would have implemented the Pro 2 the other way around: set it to generate conventional voltages as standard, and use the DC offset to push it into more esoteric ranges if needed. I discussed this with Dave Smith and he confided, “We’ve had a handful of requests to add a Global parameter to shift the CV ranges, and it’s a possible future feature.” That’s good news. I spent many days experimenting with the Pro 2’s analogue connectivity, and I particularly liked its ability to scale its CV Ins and Outs to match synths that don’t track 1V/oct precisely. But not all was hunky–dory. For example, once ‘connected’ in the modulation matrix, the CV inputs can affect parameter values even when they’re sitting at 0V. I found that a DC offset of –2 was needed to correct CV In1 and CV In2, whereas an offset of –10 was needed to correct CV In3 and CV In4. I contacted DSI’s technical support team, and they confirmed that this was normal. They told me that, “There will be some offset inherent on the CV inputs as we assume that a device driving the CV input will have some amount of its own offset as well. In this way, one would likely correct for the overall offset on the external device or in the Pro 2 itself.” This boils down to, ‘we’ve allowed an offset error within the Pro 2 because there might be one in the external voltage.’ I can’t be alone in thinking that this is unsatisfactory, can I? 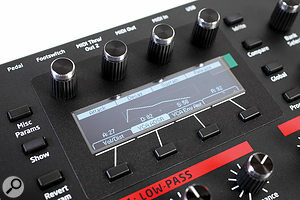 Although the claim that the Pro 2’s “is the most powerful step sequencer ever designed on a synth” is possibly overstating the case, the facilities provided by its 16, 16–step tracks (which can also be configured as eight, 32–step tracks) place it in the premier division of on–board analogue–style sequencers. Every patch contains a sequence with Track 1 connected to the pitch of the note, and you can then direct every other track to any of the modulation destinations. All the usual facilities are provided — ties, rests, slew, legato or retriggered notes, variable-length sequences, MIDI sync, and so on — and you can transpose sequences, set them to loop continuously or play once through per trigger, or play one step each time that a trigger is received. Recording is simple, and sequencing things such as filter sweeps is a doddle: just twist the parameter’s knob while the sequence is running. (You can also determine values on a step–by–step basis if you prefer.) Once you’ve programmed your patches and recorded their sequences, you can even build songs using Cue to switch between them, whereby the current patch/sequence is completed before the next is initiated. Unfortunately, I have to point out a serious oversight: you can’t send triggers or gates directly from the sequencer. I think that DSI will have to add this if the Pro 2 is going to justify the company’s claim that it’s “a natural choice for the centre of your [analogue] studio or live setup”. Finally, we come to the arpeggiator, which offers Up, Down, Up/Down, Note Order, and Random modes that can be driven over a one-, two- or three–octave range, with each step playing up to a maximum of four instances per note. There’s also a Latch, which works together with the Hold function to provide a further selection of useful results, and everything can be sync’ed to the synth’s internal clock or MIDI Clock. Just be aware that the arpeggiator doesn’t transmit the generated notes via MIDI. “Well, it’s got to have at least four types of filter,” someone might have suggested. “Four oscillators and a sub–oscillator,” someone else piped up. “And four LFOs,” suggested the next. Don’t be put off by the Pro 2’s OLED screen, its menu structure is very shallow. “And five contour generators”, added another. And so it continued late into the night until the design brief included everything that they felt we might want from a flagship monosynth. The result was not only a powerful synthesizer, but a rather beautiful one too. From the sleek walnut case and steel chassis, to the fabulously precise OLED screen, to the almost universally wobble–free pots and encoders, everything screams ‘Program me!’. 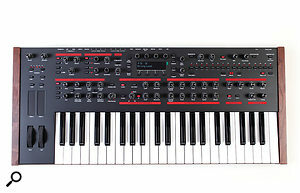 Given that the Pro 2 also offers dual pressure– and position–sensitive ribbon controllers (which means that you have six degrees of performance control under your left hand in addition to the 44–note, semi–weighted, velocity– and pressure–sensitive keyboard under your right) it also commands, ‘and, while you’re at it, play me too!’ With four velocity curves and four levels of aftertouch sensitivity to choose from, plus three modes of key assignment as well as single– and multi–triggering, I have little choice but to do so. In truth, there are so many nice touches to the Pro 2 that it’s impossible to discuss them all here. Nevertheless, it’s not a difficult synth to use; if you want to twiddle knobs and press buttons to see what ensues, it allows you to do so. But if you want to use it to its fullest, you’re going to have to put in a bit of work, especially since turning a knob or pressing a button will often reveal additional on–screen parameters. Happily, the menu structure is very shallow, so nobody but the most hardened analogue nutter should have a problem with this. So, what of the sound? With remarkably little aliasing (unless you ask the Character effects to generate it) the Pro 2 can sound astonishingly ‘analogue’. It can also produce all manner of vintage (grainy) and modern (smooth) ‘digital’ sounds. So I’m not going to delve into the clichés regarding screaming leads and thunderous basses, or all the other hackneyed phrases used to describe monosynths, because it’s capable of so much more than that. Indeed, if you experiment with things such as the modulation matrix, the character effects and the multiple overdrive/distortion and feedback stages, you’ll soon discover powerful sounds that you’d never obtain from any integrated vintage monosynth. Sure, there are limitations, but I was always impressed by the versatility of the Pro 2. At times, I was tripping over complex, evolving and involving sounds that could have come from the BBC Radiophonic Workshop in the ’60s and ’70s, and that’s no small accolade. So, finally, let’s return to that niggling question about the relationship between the Prophet 12 and the Pro 2. Polysynths almost always have simpler voicing structures than monosynths because hyper–complex sounds rarely work as well polyphonically as they do monophonically. Consequently, it should be no surprise to find that the voice structure of the Pro 2 is more complex (and more aggressive) than that of the Prophet 12. Does that mean that the Pro 2 is in some way better and that you should therefore buy one in preference to a Prophet 12? The correct response to that is ‘don’t be daft”. The Prophet 12 has facilities that the Pro 2’s lacks and, despite their similarities, they were designed to do different jobs, and they remain distinct in both sound and use. Many prospective owners will view the Pro 2 as a sound designer’s dream, while others may find it too detailed and look elsewhere for something simpler. But it’s not as complex as it seems, and you’ll soon be wringing everything from delicate, PPG–esque timbres to monstrous, overwrought sounds and sequences from it. Selling for little more than a well–preserved Pro One or Mono/Poly, it blows its ancestors away, and when you consider what it might cost to buy and maintain a vintage synth and step sequencer, the Pro 2 begins to look like very good value too. In 20 years, I wouldn’t be at all surprised to see some youngster point at a Pro 2 and proclaim that they don’t make ’em like they used to. The Moog Sub 37 is probably the closest competition for the Pro 2, and this also builds upon the reputation of a revered ancestor while stretching its sonic and performance capabilities way beyond what was possible in the 1970s and 1980s. Both are excellent synths with great strengths, and both will appeal widely. The Sub 37 is more immediate and has bucketfuls of that classic Moog sound, while the Pro 2 is much more flexible and can be integrated into an analogue studio in ways that the Moog can’t. Both are top-quality instruments, and I recommend that you win the lottery and buy both. Although primarily a monosynth, the Pro 2 echoes instruments such as the Korg Mono/Poly which, back in 1981, allowed you to play up to four single–oscillator notes through its single VCF/VCA signal path. Happily, the Pro 2 is much more flexible than that, because the amplitude of each note can be shaped individually by the amplifier contour generator, and the tone of each can be shaped individually using tools such as waveshaping and sync. I programmed all manner of analogue piano and Clavi-style patches as well as some luscious pads, ensembles, analogue choirs and spacey organs using a combination of dynamic waveshaping, modulation and delay, and I suspect that few (if any) listeners would realise that they emanated from a paraphonic synth rather than a true poly. Nonetheless, I have three minor complaints in this area, although all are operational, not sonic. Firstly, I can’t understand why the waveform selector can’t adjust the waves for all four oscillators simultaneously in paraphonic mode. Secondly, there’s no ‘All Oscillators Shape Mod’ parameter in the modulation matrix. Thirdly, there’s no way to sequence four–part compositions in paraphonic mode. Counter–intuitively, you can record and play four–part compositions in monophonic mode by turning off Key Follow for oscillators 2, 3 and 4 and then assigning three other tracks to control their pitches. But when I tried this, the results didn’t justify the effort. DSI told me that they’re considering paraphonic sequencing for a future update, so I think that I’ll wait for that. Although the Pro 2 offers 792 patches, half are factory sounds that can be edited but not overwritten. This means that you have 396 memories for your own creations. It’s still a generous number, but I’ve never understood why manufacturers do this. It also offers four playlists, each with 16 slots. These allow you to place your sounds in a desired order (which is a boon on stage) without having to reorder them in the patch memory. In addition to its quarter–inch stereo audio outputs and the associated headphone output, the Pro 2 offers an Audio In that accepts a wide range of signals and injects them into the internal signal path via the oscillator mixer. You can also derive control signals from the external signal using the associated Gate extractor and Envelope Follower. But if no cable is plugged into this socket, its Level and Gain controls determine the amount of final output signal that’s internally fed back into the mixer, emulating an old Minimoog trick used to thicken the sound or cause screaming chaos. Inputs for a footswitch and expression pedal are also provided and, sandwiched between these and the audio I/O, you’ll find no fewer than four CV Ins and four CV Outs as well as a Gate Out, all on 3.5mm sockets. I would have preferred these to be quarter–inch too, but DSI appears to be looking toward the Eurorack market here, as evidenced by its own DSM01 filter module. Digital control is provided by a bi–directional, class–compliant USB port (MIDI only, not audio) and three five–pin DIN MIDI sockets labelled In, Out and Thru/Out2, the action of the last of which is defined by a Global parameter. As you would expect, the Pro 2 offers extensive MIDI capabilities, and the largest section of the manual (nearly 40 pages!) is dedicated to NRPNs which, as well as mapping all the controls, include such things as the values in each of the steps in each of the tracks in a sequence. Finally, there’s an IEC socket for the synth’s internal, universal (50/60Hz, 100–240V AC) power supply. Introduced on the Prophet 12, the Special Waves were added because the engineers at DSI felt that they extended its range of timbres in interesting ways. Their names — such as Boing, Ahhh and Shrill — are roughly descriptive (of the waveforms, not the engineers) but their uses are by no means limited to creating sounds that go ‘boing’, voices that go ‘ahhh’, or anything shrill. However, the real power of the Special Waves lies in your ability to place three of them in a line and morph between them, either playing the static waveform derived at any given point on the line, or modulating that position in interesting ways. This can take the Pro 2 far beyond the range of sounds that you might expect from it. I even used the Decimate and Hack effects to reduce the sample rate and word length, and then programmed the Pro 2 in paraphonic mode as a filterless, four–voice, 8–bit wavetable polysynth, and imitated the legendary PPG Wavecomputer 360A, a hopelessly unreliable synthesizer that I nonetheless bitterly regret selling. 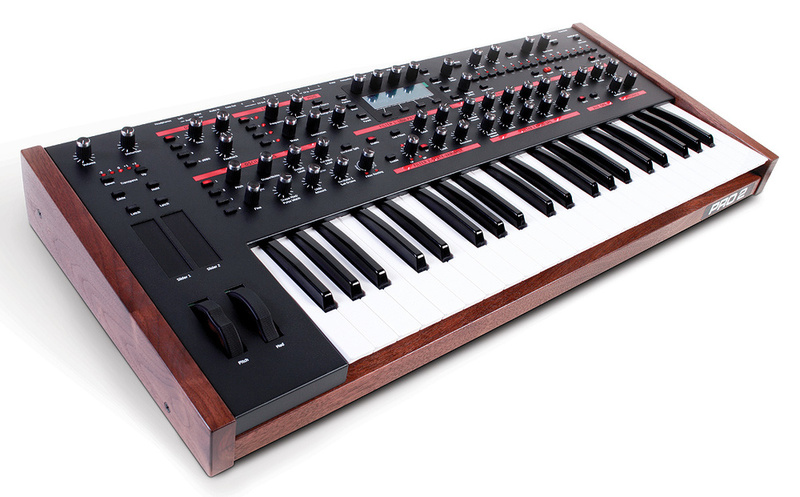 A synth nightmare or yet another accolade to the Pro 2’s flexibility? You decide. Hybrid analogue/digital monosynth with four–voice paraphonic capability. 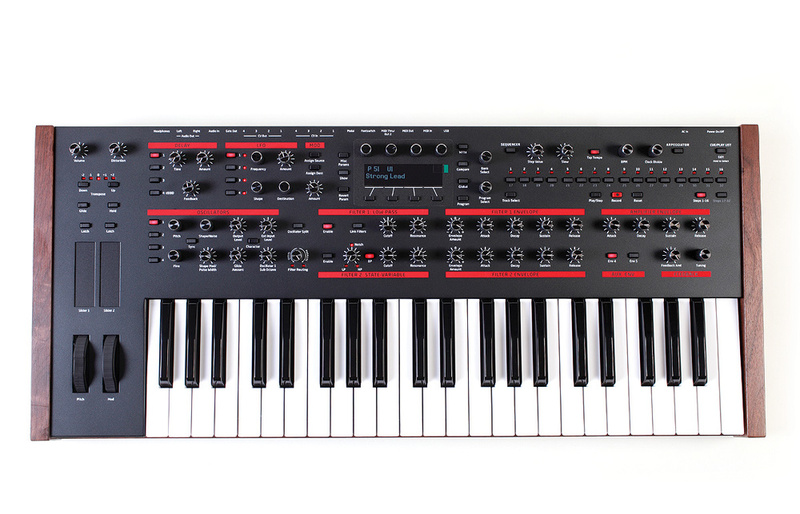 Semi–weighted 44–note keyboard with velocity sensitivity and aftertouch. Pitch–bend and mod wheels, plus dual, latchable, position/pressure–sensitive ribbons. 396 factory plus 396 user memories, with 4 x 16-slot playlists. Four, each offering 29 waveshapes and three noise colours, with independent waveshaping per oscillator, plus cross–mod, AM, and hard sync. One sub–oscillator derived from Osc1. One resonant (self–oscillating) 24dB/oct LPF. One resonant 12dB/oct state–variable LP/BR/HP/BP filter. Tunable bipolar feedback loop from the output of the amplifier section to the input of the Character section. Four sync’able digital delays with independent modulation for flanging/chorus/ensemble effects. Five HADSR envelopes with looping, assignable within the modulation matrix. Four with sync, phase offset and slew. Sixteen slots, 51 sources and 142 destinations. Up, Down, Up/Down, Note order, Random. Five–pin DIN In, Out, Thru/Out2. Four x CV In (1V/oct). Four x CV Out (1V/oct). Four x Gate Out (10V). External Audio In with Envelope Follower and Gate Extractor. Internal 50/60Hz, 100V 240V PSU. It looks and sounds gorgeous. It can produce the dirtiest, angriest sounds I’ve ever heard emanating from an integrated synth. It’s deep but not impenetrable. Paraphonic mode is much more useful than you might imagine. The amount of analogue connectivity is unusually high for an integrated synth. There are issues with the CV architecture to be addressed. The sequencer would benefit from further development. Dave Smith has been asked on numerous occasions to release a modern incarnation of the Pro One, but the Pro 2 isn’t it. It’s much, much more than that. And, although a superficial glance suggests that it’s similar to one voice of the Prophet 12, it’s much, much more than that too.